Luxury can be a word that is often overused in real estate today. But for Workman Ranch, no other word can do it justice. 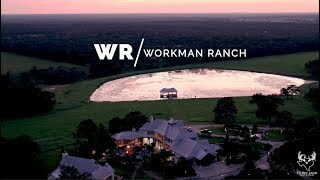 From its location to its improvements, Workman Ranch is truly one of the ones. Located just 16 miles from College Station and Texas A&M University, it leaves little to be desired for, and builds greatly upon one’s imagination. The main home is a spacious 7,135 square foot, with approximately 3,500 square foot of balconies and covered porches. It boasts 5 bedrooms and 5.5 baths. The exterior of the home is built with Austin stone and covered with an elegant metal roof and is accentuated with many large windows and french doors filling the home with natural light. The main house/outdoor kitchen & pool are on an engineered pier & beam concrete foundation. In the interior, the large floor plan on the first floor provides ample living areas, a bar/office area, workout room, and large kitchen. The second floor is comprised of a game room, master and guest bedrooms along with a theatre room. You can also enjoy lake and pool views from several balconies. The flooring inside varies from mesquite wood to stone. The home also boasts an elevator, four gas fireplaces, a 4-car garage, and backup generator. An iPad or phone can be used to control the entire home’s lighting, temperature, fire places, and more than a dozen TV’s. The front of the home features an irrigated lawn with beautiful landscaping, colorful flowers, accent lighting, fountains, and a meandering creek that flows into a lily-filled koi pond. A 1,648 square foot guest home is located just beyond the pool area. With 2 bedrooms and 1 bath, it’s perfect for guests, family, or corporate meetings & retreats. Tall ceilings, a fireplace, and exquisite furnishings make you feel right at home. As as nod to luxury, a walk-in wine cellar keeps your wine at a constant temperature and humidity. The ranch features eight ponds & lakes comprising over thirteen acres of surface water, which are great for fishing, or use for wildlife and livestock. The largest is a seven-acre lake just north of the main house. This lake has been professionally constructed, stocked and managed to be a trophy fishery. Largemouth bass, coppernose bluegill and red-ear sunfish are managed to their greatest potential, and the forage fish are supplementally fed through automatic fish feeders. Florida-strain bass up to 8 lbs have been caught! The pond is also home to tilapia and channel catfish. The large lake features a custom-built, covered dock with boat-slip that makes for a great area to fish, relax, or keep a boat, and it’s even lighted for late-evening outings. The remaining ponds offer clear water, great fishing and each have their own character from docks to lilies and cattails. The property is ag exempt, fenced & cross-fenced for livestock. Scattered pastures offer excellent grazing for livestock on improved grasses, and the property produces horse-quality hay currently. The wooded areas offer superb hunting opportunities for deer, hogs and other game. There is ample room for recreational activities like trail riding with horses or ATV’s on property’s numerous trails. To help with maintaining the ranch, there are several implement/hay barns for storage out of the elements. Three waters wells are in place, including the large windmill near the entrance. From College Station, head west on FM 60. In Snook, turn south on FM 2155. Turn right on FM 1361. The property is on the right side of the road, marked with gated entrance that reds "Workman Ranch." Shown by appointment only.